This entry is from Dr. David Toews, Banting Postdoctoral Researcher at Cornell University. David’s uses genomic data in combination with phenotypic, geographic, and behavioral data to ask questions about the evolution of birds. Evolutionary and hybridization genomics / molecular ecology. In practice, my work is now divided three ways: 1) molecular work, mostly prepping libraries for Illumina sequencing (recently whole genome resequencing and reduced representation ddRAD) 2) bioinformatics and analyzing Illumina data and 3) collecting blood samples from birds in wild populations. Not really applicable at this point! General answer: Answer emails right away – I am a believer in a kind of “email zero” (with flagging). Less general answer: I love making figures. I find base graphics with R plus Adobe Illustrator is the most efficient method. Super nerdy answer: having a keyboard shortcut that sends script text straight from TextWrangler to the Terminal is a lifesaver. When I am in the lab / office I am usually in bed by 11:30 – 12pm, and I am also a late starter – up at 8:30 and into work a bit before 10am. However, in the field we are up at ~4:30am, work until noon, afternoon nap, and then in bed by 8:30pm. For me, life trumps school and/or work, and this rule is an important part of work-life balance for me. I generally don’t work on evenings or weekends, but when I do it is usually because I am extra excited about analyzing some new data that has just come in, or working on a draft of a paper with a glass of wine. 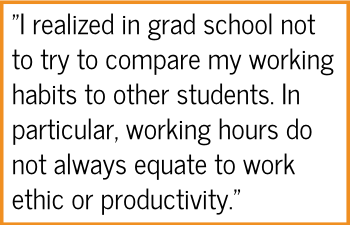 I realized in grad school not to try to compare my working habits to other students. In particular, working hours do not always equate to work ethic or productivity. Part of the reason I wanted to stay in academia was that I knew better than anyone else when and how I work best, and this responsibility is one of the perks of our field. I also try not to put off things that I don’t want to work on, because it can be easy to excessively procrastinate on those things. Finally, I very much enjoy some of the core aspects of our discipline, namely writing papers and coming up with creative ways to display data. If you don’t already, finding ways to enjoy these aspects of the job can make everything much easier/more enjoyable.